Not only does the soil change in Prepotto, but it favors red grapes in a wider area known more for white. In their 30 years at the helm, the team behind Le Due Terre has proven themselves to be experts of making red wine in Friuli. They use the clay to grow plush and elegant Merlot, while the marl hosts the rest of their vines. With just four cuvees, Le Due Terre is able to provide a true Italian answer to Burgundy, a terroir suited to Merlot, and two bottles of indigenous Northern Italian wine for the capricious drinker. Although not certified, their farming style is consistent with and even beyond organic practices, while their vinification is natural and non-interventionist. Each wine is fermented in stainless or concrete, then transferred to neutral oak for 22 months of rest. The formula is the same every year, and the wines are elegant, faithful to terroir, and very high quality. When talking about blending grapes for the Due Terre blends, Flavio says he made the blend when he planted the vineyard. Bold and tannic yet plush and jammy, this Merlot is bursting with forest fruits, chocolate and herbs. The biggest of Due Terre's reds, this wine can replace any need for Bordeaux, whether you're serving steak or cellaring for dinner a decade later. Red floral notes join the tangy, brambly berries on the nose of this classic yet faintly wild Pinot Nero. The palate is silky and gentle, but a firm acid and minerality add an ageworthy structure able to withstand the years. As it matures, it picks up some spice and gaminess, while showing off its impeccable elegance. This red is a 50/50 blend of two Northern Italian indigenous varietals. Refosco is a powerful and tannic grape with a wild personality and notes of plum and berries, while Schioppettino rounds out the blend with darker fruit and pepper notes. The latter grape is also local to Prepotto and has been vinified there for at least 1000 years. 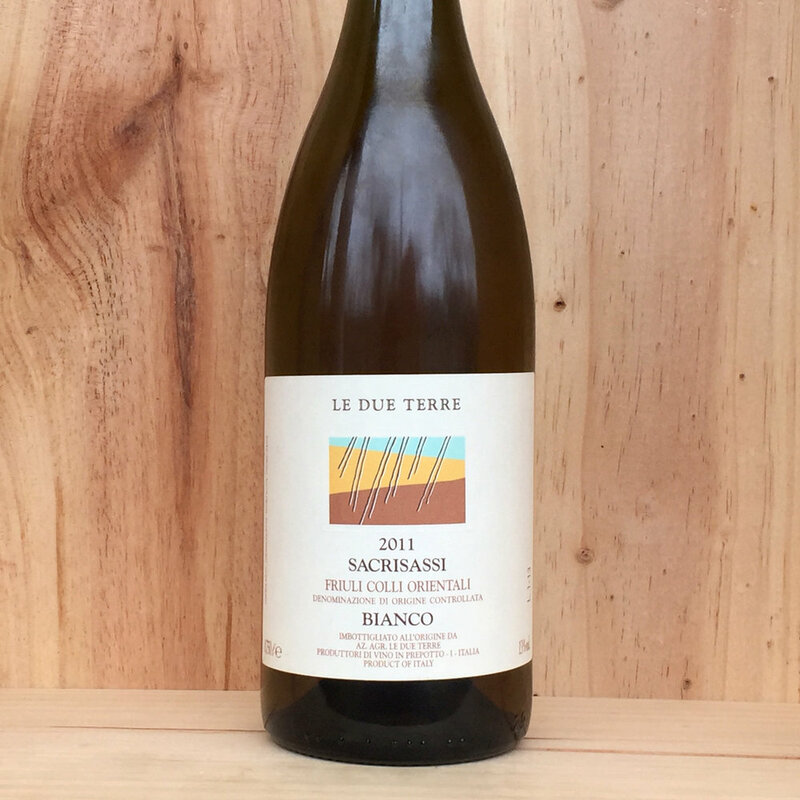 The only white made by Le Due Terre is a blend of 70% Tocai Fruilano and 30% Ribolla Gialla. Although the wine sees 10-12 days of skin contact, it's only enough to add a subtle bump in texture, not the tannin and tint of a true "orange wine." Freshness is still the focus here, with an ample acidity cutting through the weighty palate and exotic notes of jasmine, herbs and tropical fruits.